One of Canada’s largest and oldest law firms, Borden Ladner Gervais (BLG) ventured into arbitration in the 1980s as an offshoot of its work in international trade matters. The group developed under the guidance of two key partners: Gerald W Ghikas QC (now an independent arbitrator in Vancouver) and Edward Chiasson, an arbitrator in an early NAFTA investor-state case who returned to the firm in 2016 after nine years as a judge at the Court of Appeal for British Columbia. These days partner Robert Deane in Vancouver steers the international trade and arbitration group. The Vancouver team includes Craig Chiasson, who was promoted to partner in 2016 and formerly worked in the international arbitration group at Freshfields Bruckhaus Deringer in Paris. Recently promoted partner Hugh Meighen joined the Toronto office around the same time after five years with Freshfields in London and Dubai, having also served as an assistant legal counsel at the Permanent Court of Arbitration in The Hague. The team has expanded in 2018 with the hire of Milos Barutciski and Matthew Kronby from Bennett Jones. Barutciski was counsel to Lone Pine Resources in a NAFTA chapter 11 case, while Kronby is the former director general of Canada’s Trade Law Bureau, and is an expert in NAFTA investor-state claims. 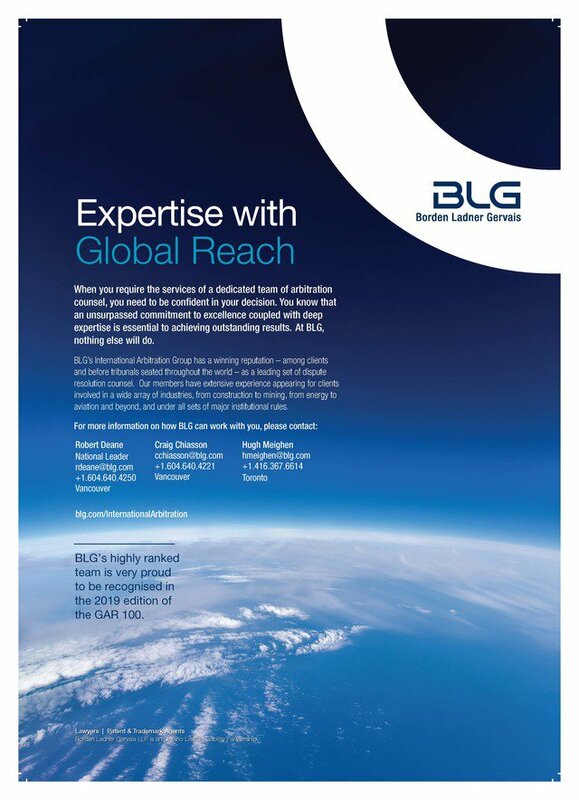 Another name to know is Bruce Gailey, a former in-house arbitration counsel at Alstom who joined BLG as a foreign consultant in 2015 working from Zurich. The arbitration team is based primarily in Vancouver, although there are experienced partners in Calgary, Toronto and Montreal. The firm also has an office in Ottawa. The government of Mexico has been a prominent client, particularly in NAFTA-related matters. At their previous firms, members of the group have also had experience defending Turkey and South Africa and representing private investors in claims against Argentina, Yemen and Georgia. Private clients who have used the firm on arbitration matters include HS Orka, a subsidiary of renewable energy group Alterra Power; United Technologies Corporation; engineering firm SNC Lavalin, Arbutus Biopharma, and Lumina Copper. In 2017, the firm secured a victory on behalf of an Icelandic geothermal power producer in an Iceland-seated Stockholm Chamber of Commerce arbitration with the proponent of a potential new aluminium smelter in Iceland. In the following year it secured a favourable settlement for South American and Canadian clients in a dispute over the construction of a mine in Central America, with several hundred millions of US dollars were disputed. Partner Bruce Reynolds left the Toronto office in 2017 after 27 years to become a partner at Singleton Urquhart Reynolds Vogel in Toronto. The Calgary office is also representing Geophysical Service Inc. in a potential US$1 billion NAFTA claim against Canada relating to the handling of proprietary seismic data, while the Vancouver office is acting in an international arbitration in connection with a partnership agreement around the new Parq Casino project in Vancouver. BLG continues to act for Canadian company Lumina Copper in a US$100 million investment treaty claim against Poland over the revocation of two copper exploitation permits. The firm is also counsel to a Canadian sporting goods manufacturer in an ICC arbitration against its exclusive Japanese distributor. Regional analysis from arbitrators around the globe, focussing on key developments in specific industry areas and jurisdictions.